Sweet mango & mashed avocado is heavenly, especially with the added crunch of jicama in these delightful spring rolls. I absolutely love looking out to my back yard through our bay window. Although the trees are bare and the grass is brown, the site of beautiful red cardinals grazing off the bird feeder, all but makeup for the lack of color due to winter months. And although it is still a little chilly some days, the sunlight warms the room and reminds me that Spring isn’t too far off. This sunlight, not only makes this the perfect sitting area for gazing, but it also makes this the perfect place for ripening those stone fruits not quite recipe ready. 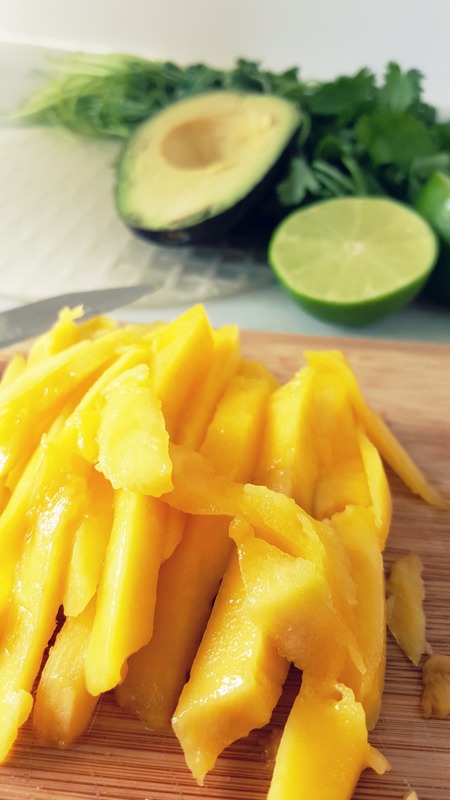 The mango and avocado I recently purchased from the market have patiently been sitting on the table, just waiting for the sun to ripen & sweeten them up for the perfect recipe. Meanwhile, as the sun was doing its thing, there was this wonderfully, crunchy jicama just waiting to join the party as I had something wonderful in store for them. Mango Avocado Spring Rolls with a Spicy Lime Dipping Sauce. Doesn’t that just sound light and refreshing? So, let’s get started,,,,no need to wait. 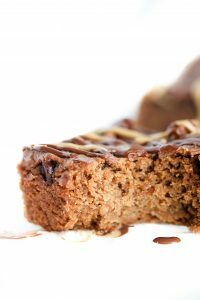 You can eat these as an appetizer, snack or better yet, make them ahead of time and put 2 in your kid’s lunchbox tomorrow. They’ll wonder what they did to deserve such a yummy lunch. Grab all your ingredients and make sure to slice, then dice your mango first. Just set it aside as you get your avocados ready. This avocado mash is super easy and quite tasty, even on its own. With a little bit of lime juice and a handful of fresh chopped cilantro, you’ve just done the hardest part of this recipe. Now, stir in the diced, sweet mango and make sure it’s combined well so every bit will have that extra bite of sweetness. Here is where the added texture comes in, with the use of jicama. 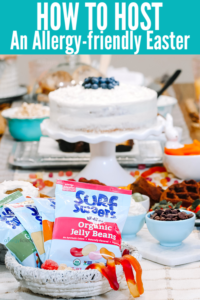 In case you’ve never used it before, head on over here for a quick intro to this wonderfully, crunchy food. It’s like a turnip but tastes more like an apple, so in case you cannot find any in a store near you, just reach for your best apple (granny smith or honey crisp would be great) and use that instead. Simply grate and set aside. Have you ever used rice paper before? It’s typically in the Asian section of your markets and can even be found in your local Target & Wal-Mart. In order to use it, you must let it sit in warm water for 10-20 seconds. I do this by heating water in a shallow saucepan and simply pouring a little into a pie pan then submerge the rice paper until it gets nice and soft. 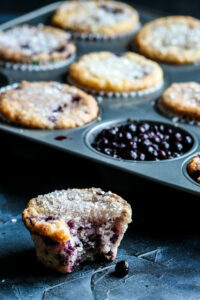 You’ll want to keep replacing the water as it cools with a little more warm as you go so the rice sheets soften easily. Remove your sheet, let it drip into the pan for a minute then lay flat on your surface. Spread a thin layer of your ingredients down the middle: spinach, avo-mango mix then your shredded jicama. Fold the top down and the bottom up to just cover the edges. Pull left side over, covering the filling then roll towards outer edge. It’s easier than folding a burrito, especially because the paper sticks so nicely together. Plate & serve with Sriracha Lime Dipping sauce! Don’t you just want to start making this right now? 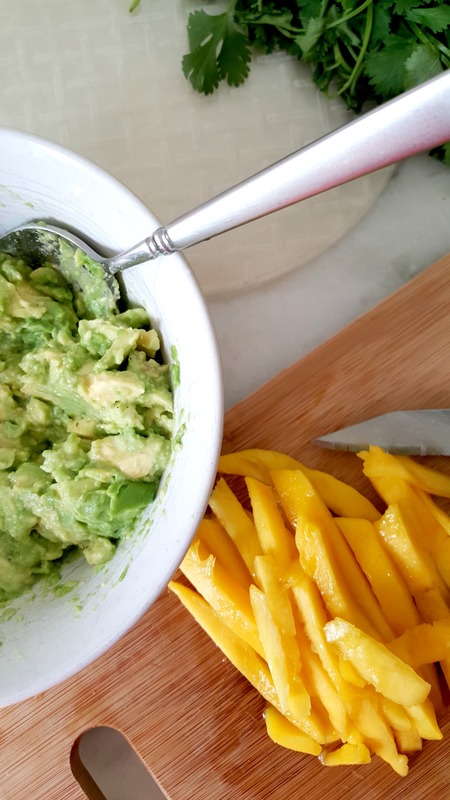 Sweet mango & mashed avocado is heavenly, especially when paired with crunchy jicama. Once dipped in this spicy lime & soy sauce, it’ll be a party in your mouth. In a medium size bowl, combine mashed avocado, lime juice, and cilantro. Fold in cubed mango and jicama. In a small bowl, whisk together tamari, lime juice, agave & Sriracha. Season with salt & pepper. Set aside. Prepare your assembly line and make 1 roll at a time. Poor warm water into a pie plate. Place 1 rice paper into the water and submerge, making sure entire paper is covered. The warm water will soften the paper for the next step. 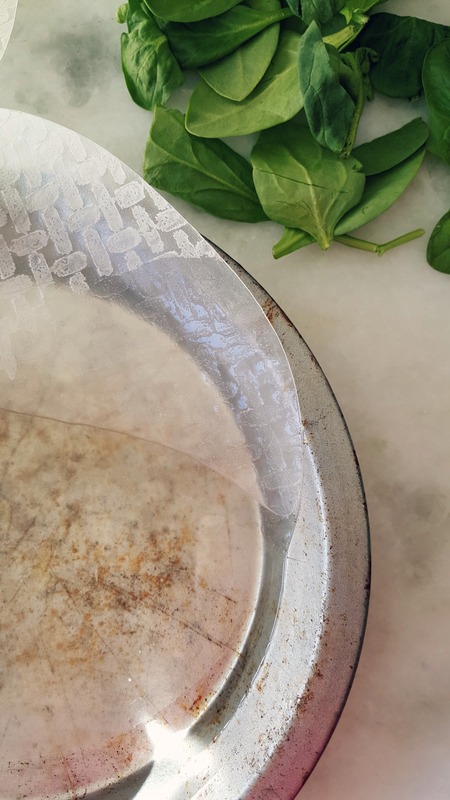 Gently, lift rice paper from the pan and allow to drip for a moment. Lay flat on your surface. Line center of paper with spinach, then top with 1/3 C. of avocado mix (just like you’d make a burrito. Fold bottom and top toward the center. Fold Left side over the middle then roll firmly towards opposite end. Transfer to a plate and continue with the rest of your rolls. After about 2 rolls, the water will start to cool. I like to dump out the water in my pan and add some fresh, warm water. As always, I’d love to see your photos of this dish on instagram (@xanderfriendlyfoods) or hear your feedback below. Did you add any other filling ingredients? I bet some diced jalapeno would give it a nice kick, especially to contrast the sweetness of the mango. What about using apple? Did you try that first or did you jump all in and use jicama? Can’t wait to see what you all think! I’ve never made spring rolls! I’m very tempted now! I love that you used jicama…sounds delish! 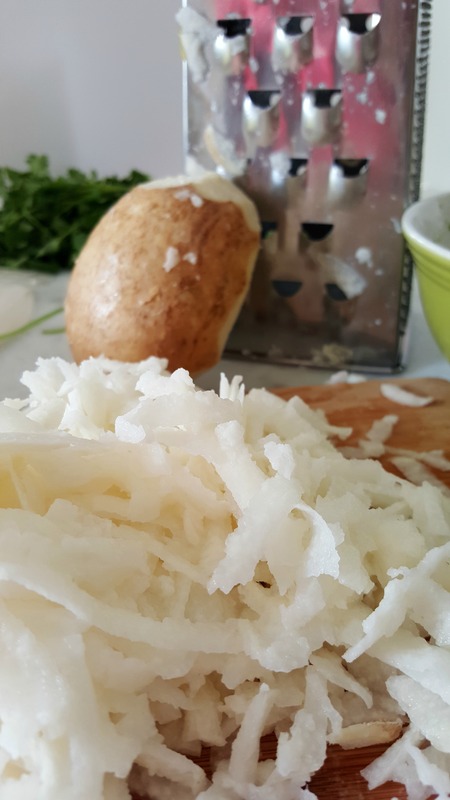 We all love Jicama in our house. It just works so well in a ton of dishes. 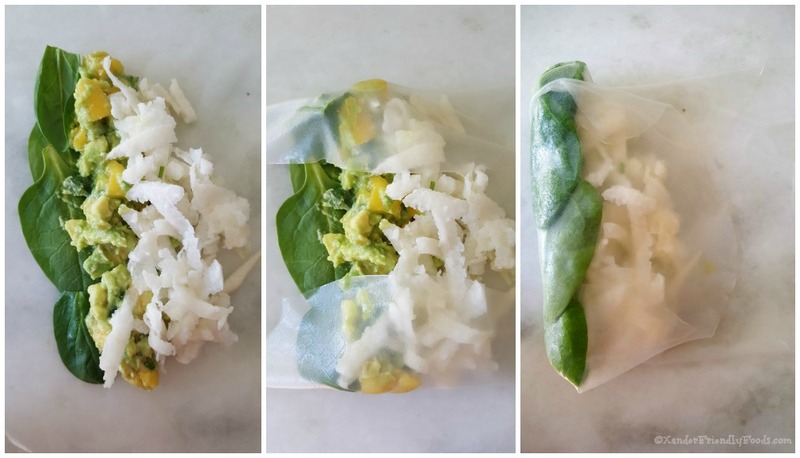 Next time you have some, you’ll have to make these spring rolls. 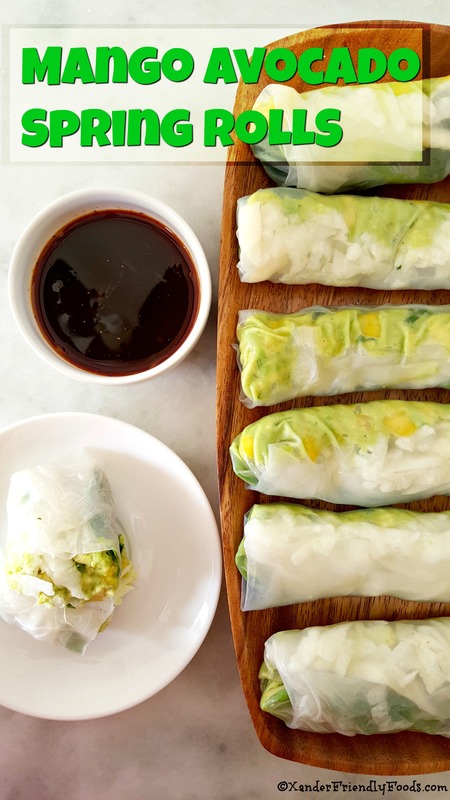 Sweet, creamy and crunchy – these are perfect spring rolls Nicole! I’d be tempted to enjoy them with spicy chili sauce. Oh yes, spicy chili sauce for the win .